It's been three months since Alexis helplessly witnessed Lydia Small's violent death, and all she wants is for her life to return to normal. But normal people don't see decaying bodies haunting photographs. Normal people don't have to deal with regular intrusions from Lydia's angry ghost, sometimes escalating to terrifying attacks. At first, it seems that Lydia wants revenge on Alexis alone. 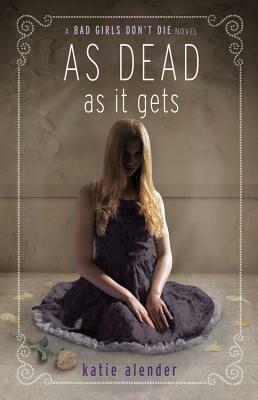 But a girl from school disappears one night, and Alexis spots one of Lydia's signature yellow roses lying on the girl's dresser the next day. Soon, it becomes clear that several of Alexis's friends are in danger, and that she's the only person who can save them. But as she tries to intervene, Alexis realizes that her enemy is a much more powerful ghost than she's ever faced before... and that its fate is tied to hers in ways she couldn't possibly imagine. Not even in her worst nightmares. Katie Alender, the author of the Bad Girls Don't Die series, is a graduate of the Florida State University Film School. When she's not writing novels, she can usually be found in her sewing room, making things for her friends or her dog (or her friends' dogs). She also enjoys reading, eating delicious high-calorie foods, and hanging out at home in Los Angeles with her husband and her very spoiled Cavalier King Charles spaniel, Winston.